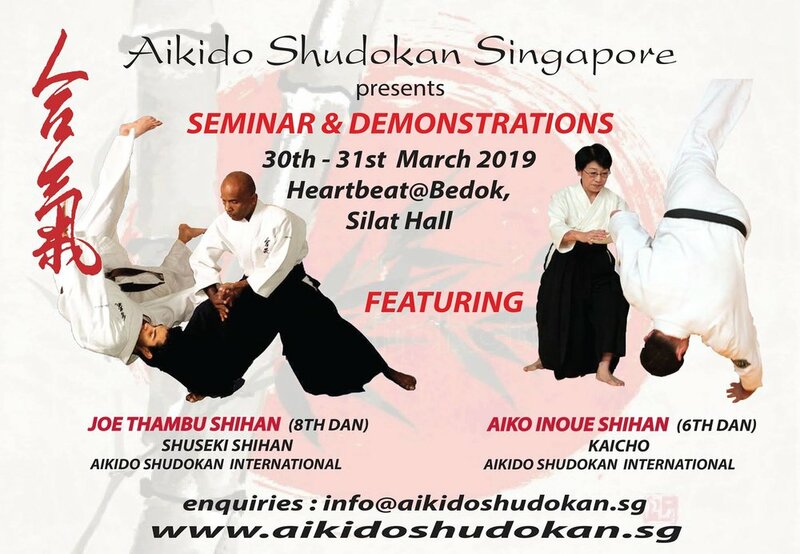 Aikido Shudokan Singapore will be hosting a seminar and public demonstration this year in March, featuring instructors from Aikido Shudokan International including Aiko Inoue Shihan (Kaicho - Aikido Shudokan International) and Joe Thambu Shihan (Shuseki Shihan - Aikido Shudokan International). The fees are $220 for both days. This seminar is open to all disciplines of martial art and certificates will be given to all participants. Don't miss this chance to train under some of the best aikido instructors in the world! Please contact us at info@aikidoshudokan.sg or through our website to reserve your spot. The public demonstration will be conducted after the seminar session on the 31st March. at 3:00pm.